Compared to regular events, corporate events are usually bigger and grander. This is why when looking for catering for corporate events, you should hire someone with experience at large events. Many companies are experts when it comes to catering for small and intimate gatherings such as weddings and birthdays. But when it comes to large corporate events, they don’t know what to do. Planning for a large corporate event can be daunting. You need to impress a lot of people, especially your boss and your clients. Not to mention that such an event is usually attended by at least a hundred guests. Having an experienced catering service by your side can lessen your burden significantly. Do not even attempt to prepare food for a large corporate event by yourself. You will surely need a professional for this type of gathering. Not just any kind of professional though. You need to hire a company that has experience in catering for large corporate events. A catering company that only deals with small events may not have the proper expertise to provide you with the service that you will needs. 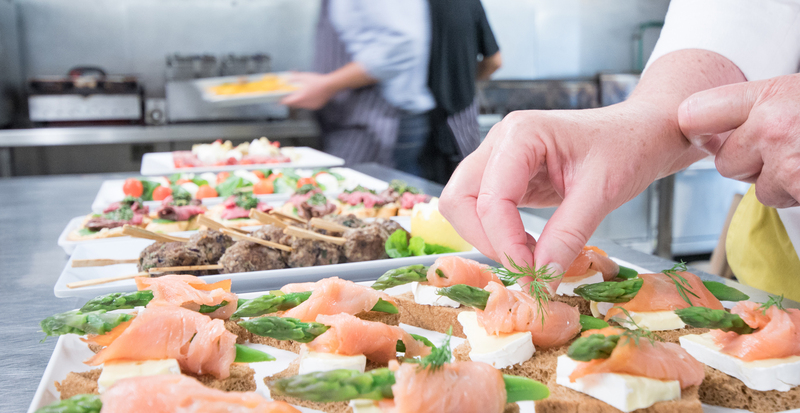 A catering company that is experienced in handling large corporate events can provide a staff of individuals that are well-trained in dealing with large guests. It will also have all the necessary materials that can help turn your event into a success. Some people avoid hiring professionals because of the cost that comes with it. What you should know is that these companies can even help you save money. Some of the best catering companies out there will be more than happy to help you work with your budget. These companies can also help you stretch your budget because they know where to source affordable yet high-quality materials and products especially when it comes to food. So if you are looking to hire catering for a corporate event, make sure to hire someone with experience in large events.